International Workers Memorial Day (IWMD) takes place all over the world on 28 April each year. The purpose of IWMD is two-fold. Firstly it is about not forgetting those who have died, been injured, or made ill by their work. Secondly it is about ensuring that tragic loss and suffering are used to reinvigorate the campaign for healthier and safer work. 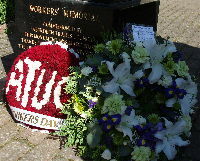 The ceremony for Workers' Memorial Day in Aberdeen took place at the Persley Walled garden, which was commissioned by Aberdeen Trades Union Council (ATUC) as part of the STUC Centenary and in commemoration of Workers' Memorial Day. The garden was opened in 1997 and is a beautiful and peaceful place. The memorial for all those who lost their lives at work is in the garden. Trade unionists and politicians came together to remember and to pledge action to ensure health and safety at work. This is the first year that the branch has taken part in Workers' Memorial Day and Kate Ramsden, Branch Chair was proud to lay a wreath in UNISON colours, in remembrance of all our fellow workers who have died while doing their jobs, or whose health has been damaged at work. The ATUC wreath was laid by Councillor Len Ironside, there representing the Lord Provost of Aberdeen City. There was a minutes silence to remember all those who have died, been injured or made ill by their work. Labour MSPs Lewis MacDonald and Richard Baker both spoke movingly of those who had lost their lives or their health at work, but more importantly of the need to continue to fight to make sure that the health and safety of all workers is protected into the future.